Along Pennsylvania Avenue, not far from the White House, there is a landmark, a federally protected building, listed on the National Register of Historic Places. 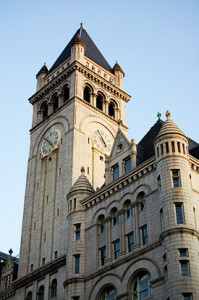 The Old Post Office Tower and complex, constructed between 1892 and 1899, boasts unparalleled, panoramic views of the nation’s capital. According to the National Park Service (NPS) on a clear day, visibility may exceed 12 miles. This magnificent structure, owned and managed by the General Services Administration (GSA) in cooperation with the National Park Service, most recently was home to an eclectic assortment of government offices, including the National Endowment for the Arts (NEA) and the National Endowment for the Humanities (NEH), and a somewhat carnival-like, garish mall serving up souvenirs and all varieties of malodorous fast food. The mezzanine revealed what remained of the main sorting center for the former post office, with a black and white checked floor. The Old Post Office building was closed in January 2014, to make way for a major, $200 million renovation and conversion to a luxury hotel by the Trump Organization. 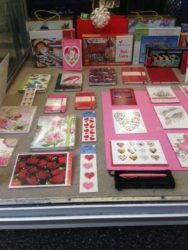 Prior to closure, an elevator ride to the 9th floor led one to a small gallery devoted to the history of the building, and from there, one could take another elevator up to the tower. The magnificent, 360 degree view is comparable to New York City’s Top of the Rock or Empire State Building, or Toronto’s CN Tower, It is, however, cold and windy at the top, lending a classical gothic quality to the experience, save for the very modern-times Park Ranger, who occupied a spare, inhospitable kiosk in order to guide and instruct tourists and other visitors. The Old Post Office building was designed by acclaimed architect Willoughby J. Edbrooke to house the Washington, D.C. post office, the Postal Department Headquarters and a Dead Letters Museum. 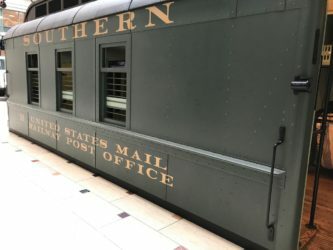 It served as the city’s main post office until 1917, when the post office moved to a larger location across from Union Station (now the site of the Smithsonian’s National Postal Museum). It would appear that the Old Post Office complex was less than functional. Within fifteen years of its inception, there was discussion of demolishing the building and replacing it with something more modern. A new threat arose in 1934, when the postal headquarters moved to the newer, nearby Ariel Rios building. Yet another attempt to destroy the building was made in 1970, but Nancy Hanks, then chair of the NEA, made it her mission to save the building. “Old buildings are like old friends,” she informed Congress, as memorialized in the building exhibit. “They reassure people in times of rapid change. They encourage people to dream about their cities – to think before they build, to consider alternatives before they tear down.” And once again the Old Post Office Tower was saved. Trump has leased the building for 60 years, with the option of two 20-year renewals. The ultimate ownership will remain with the GSA, and the Tower, it is promised, will reopen for tours when the building in complete in 2016.